One of the most famous characters to grace the hills of Addison County was America’s poet laureate, Robert Frost. In a earlier post, I joked about the ubiquity of signs alluding to Frost’s presence in the woods of Ripton, so I thought it would be fun to describe a run built on the Robert Frost theme. 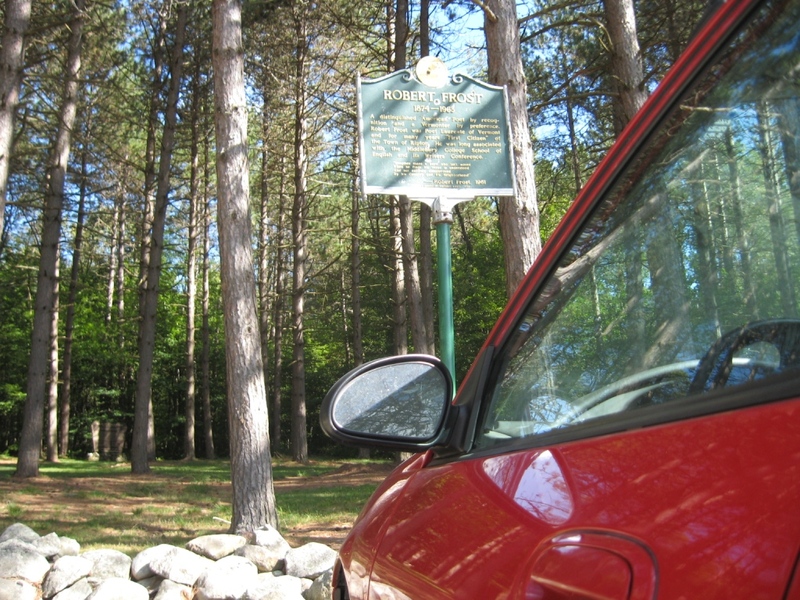 The Robert Frost roadside rest area on Rt. 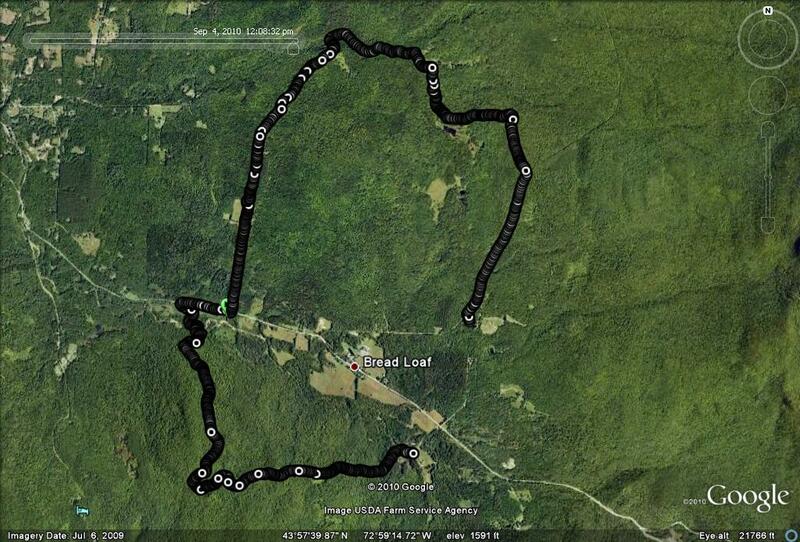 125 a few miles below Breadloaf seemed like a logical place to begin the run, given the ample parking. I also couldn’t help but notice that the nearby “Robert Frost Trail” and trailhead was still closed to the public, but more on that later. 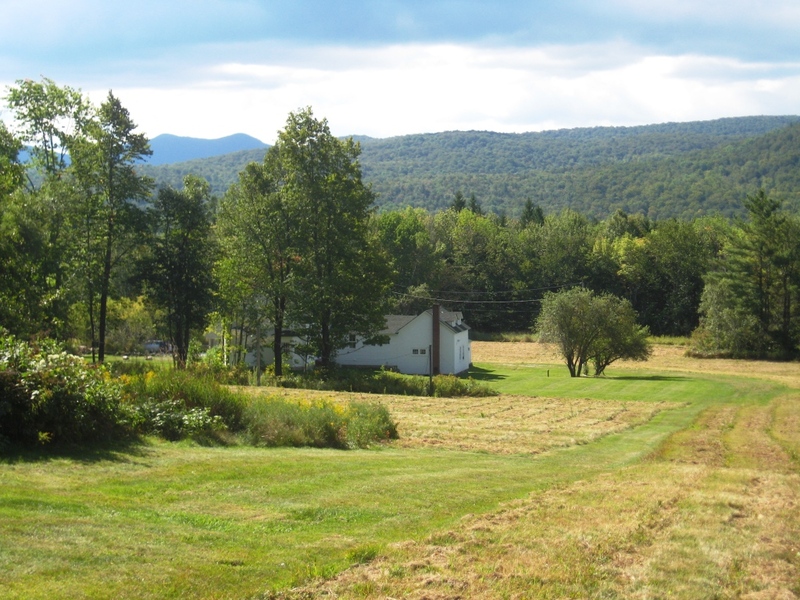 The run began with a easy jog up…you guessed it…Frost Road, until reaching the Robert Frost cabin where (guess who) summered for many years while teaching at the Breadloaf School of English. We can forgive him for the fact that for many of these years, he returned to teach at archrival Amherst College at the end of the summer. Even famous poets need a day job I guess! The view from his primitive cabin is beautiful in the late summer, with views of the nearby mountains and the Homer Noble Farm. After soaking up the meadow view, I continued up into the woods on the well traveled trail behind his cabin. This route follows much of the route described in my cross country ski trip described in my post entitled “Robert Frost Cabin” but in the reverse direction. After a little more than a mile, the trail splits, and I chose the left fork knowing it would lead to a longer run. The gradual descent on this stretch of trail led eventually to a T in the trail with signage for cross country skiers, and I chose the left turn with a short downhill before joining up with a well-developed snowmobile trail. A rather disoriented hiking couple asked for my assistance in finding their way back to their vehicle at this point. This is understandable, as there is a complex network of ski trails, logging trails, and snowmobile trails in this section of forest. If you want to try this run out and are concerned about getting lost back here, a good rule of thumb is that left turns bring you further away from Breadloaf, while right turns will bring you closer. After reorienting the slightly disoriented hikers – I haven’t heard of any recent hiker disappearances in the last few days, so I assume they made it out alive – I took a right turn on the now well-developed uphill trail which followed stream. After about a mile on this trail, I arrived at a new fork. Since the left fork had numerous KEEP OUT and NO TRESPASSING signs, my choice was clear – go right. This led to the trickiest routefinding section of this run Shortly after running by a small beaver pond (on my left) I expected to find a rough trail to my right which would connect me with the Brown Gate trail in the Rikert Ski Touring Center. I found a right turn which fit my memory of the terrain, but the trail got fainter and fainter, including a small stream crossing which didn’t fit my winter memories, but eventually connected with the well marked Brown Gate trail. A left turn here, and a moderate uphill led to the Brown Gate itself, and Steam Mill Rod/Forest service road 59. A right turn onto Steam Mill Rd led to about a mile of running on this well-graded dirt road. After all the rougher more technical running of the previous few miles, it felt good to stretch out the legs for a while in some higher tempo running. Staying on this road would take you to the Breadloaf Campus too soon, so I followed the well-marked snowmobile trail turning left shortly after passing Burnt Hill Rd. 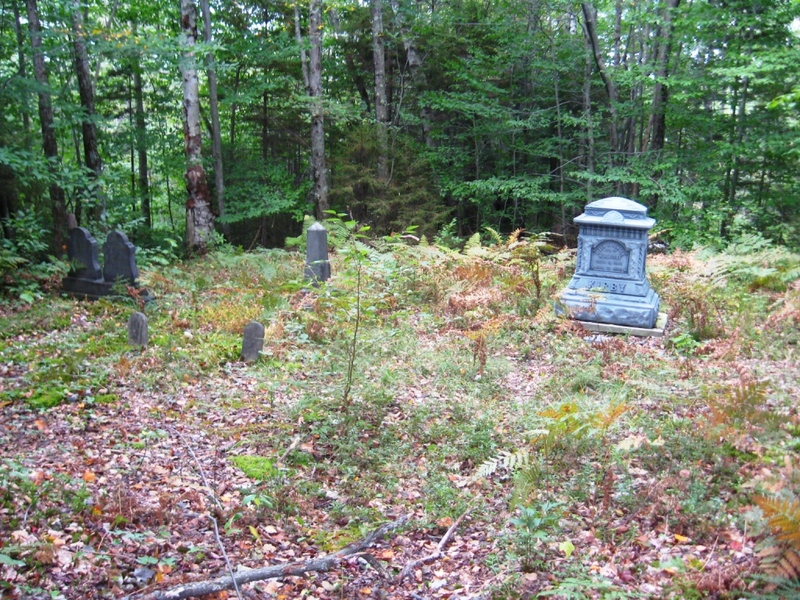 About 50 yards up this trail, I came to a small, moderately overgrown family burial plot. I knew of the existence of this mini-graveyard from past ski tours, but stopped to read the gravestones for the first time. The name on all of the stones was “Kirby” which made sense, as an older name for Steam Mill Road was apparently Kirby Road, as noted previously. I stayed on this trail which is separated from the Rikert trails by a line of trees, and after another mile or so reached Rt. 125 just east of Breadloaf. The Brooks Rd. intersection was in sight, so I headed in that direction to continue the southern half of the run. Taking the Widows Clearing trail from the south end of the parking lot brought me up to the actual clearing, the subject of yet another post earlier in the summer. The fact that the clearing still exists despite not having been farmed for a hundred years implied that someone must mow the field every year or so, and on this run I could see that it had been mowed very recently. I can’t help but wonder who has taken on this task, as it can’t be that easy to haul the necessary equipment up there. From this point until the end of the run, you will finish the run as described by following my aforementioned “right turn rule”. 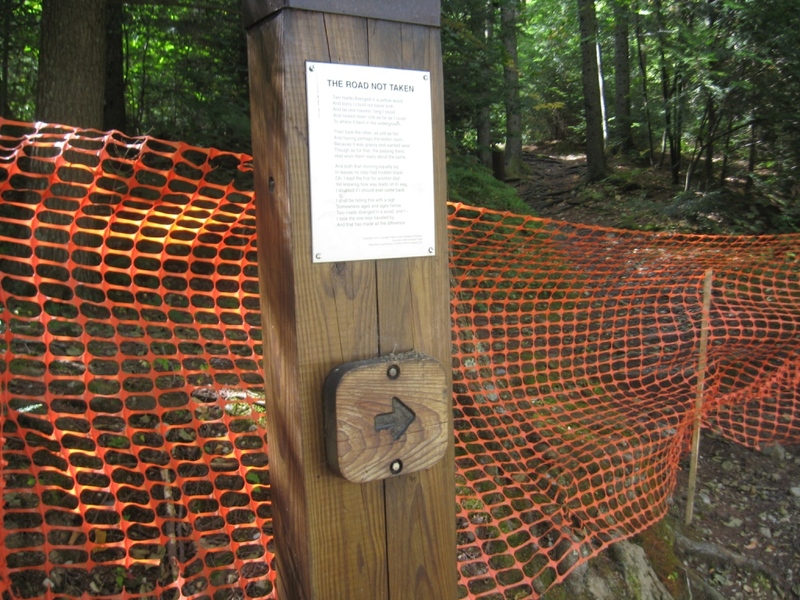 The first right turn on the Widows clearing trail takes you to a trail called “The Crosswalk”, and after a mile on this rough trail, the next right connects to the furthest corners of (here we go again) The Robert Frost Trail. This well known trail passes through woods, meadows, streams, and swamps, and at many vantages along the way, appropriate Frost poems are displayed. I noted earlier in the summer that this trail has been closed all summer, and I presumed this was due to the nearby road construction. When I arrived to the stream crossing on this trail, I found that the footbridge which had provided a means across was missing, providing an alternative explanation for the trail closing. On the shore where the bridge once stood, the Frost poem posted seemed particularly ironic, in light of the fact that the trail was blocked. It is also my favorite Frost poem, and particularly germane to this blog. A short slog across the stream past the equipment in place for the replacement of the lost bridge, and a few hundred yards on Rt. 125 brought me back to my vehicle. 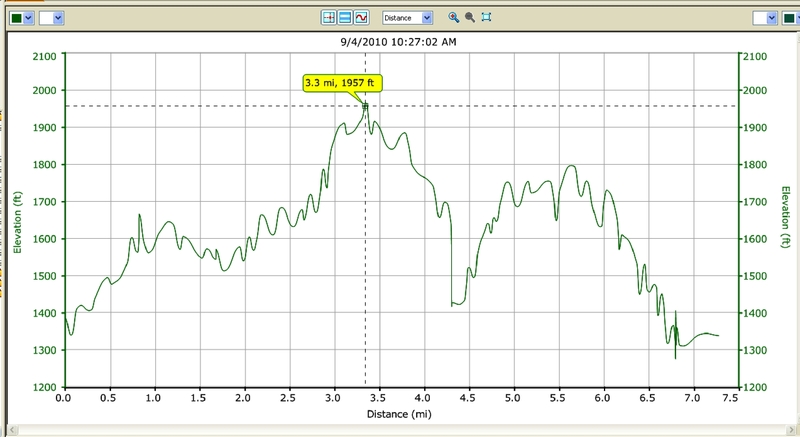 As in prior runs, the Google Earth Projection, and altitude profile are posted, but I accidentally turned off my GPS for about a mile between the Kirby burial site and Rt. 125, so the distance on this run is probably a little more than 8 miles, and although there are no individual long climbs, there were very few truly flat sections on this run, and the total climb adds up to close to 1000 vertical feet.